Enjoy a creamy, crunch combination with our Peach Crumble with Ginger. 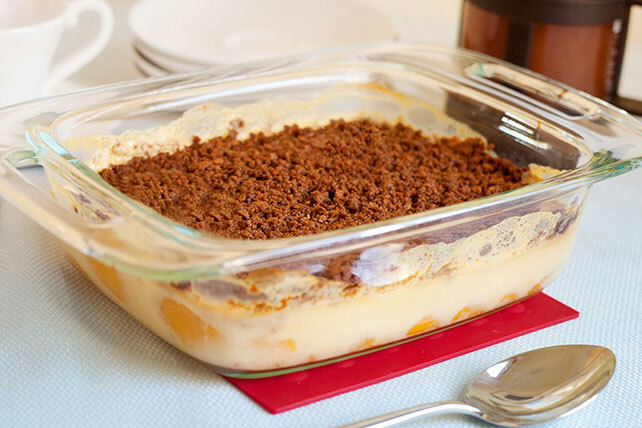 Gingersnap crumbs compliment the fruit and pudding in this delicious peach crumble. Preheat oven to 350°F. Mix gingersnap crumbs and butter in small bowl; set aside. Drain peaches, reserving 1/2 cup of the syrup. Place peach slices in 8- or 9-inch square baking dish. Pour reserved syrup and milk into medium bowl. Add dry pudding mix. Beat with wire whisk 2 minutes or until well blended. Pour over peaches. Bake 20 minutes or until heated through; sprinkle with crumb mixture. Bake an additional 10 minutes. Cool slightly. Prepare as directed, using canned pears.